In BLAME! an "infection" in the past has caused automated systems to spiral out of order, resulting in a multi-leveled city structure that replicates itself infinitely in all directions. Now humanity has lost access to the city's controls, and is hunted down and purged by the defense system known as the Safeguard. In a tiny corner of the city, a little enclave known as the Electro-Fishers is facing eventual extinction, trapped between the threat of the Safeguard and dwindling food supplies. A girl named Zuru goes on a journey to find food for her village, only to inadvertently cause doom when an observation tower senses her and summons a Safeguard pack to eliminate the threat. Special Features: Behind the Scenes Featurette, Japanese Trailers, Art Gallery. This anime is exciting. 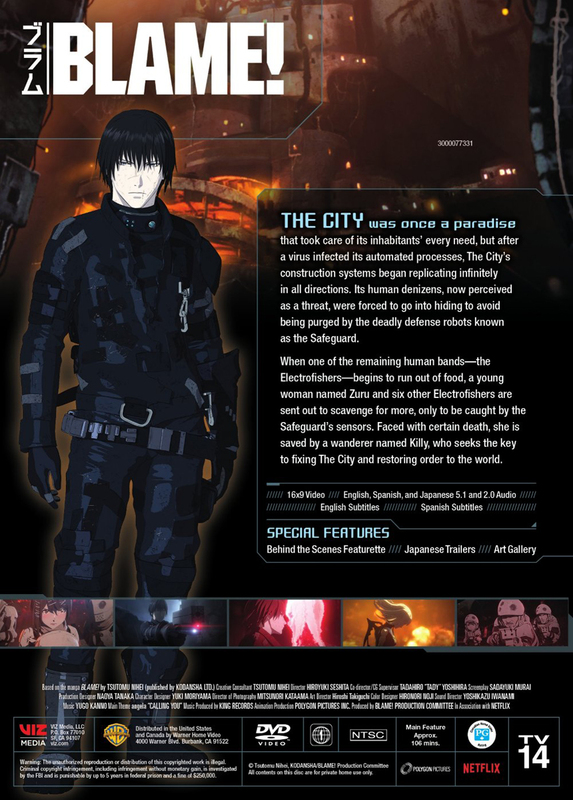 Some of it's features were seen in the knights of Sidonia. I really enjoyed the movie and it was at a great price. The anime was exciting It really seems to have a great plot and I look forward for more. The anime has some 3D features that I like. The anime is unique because it is a science Fiction in which you don't know what they would bring up and very unpredictable.